Shirts With Random Triangles: Butch Jones Says Tennessee Will Don "Smokey Grey" Alternate Uniforms Twice During 2016 Season. 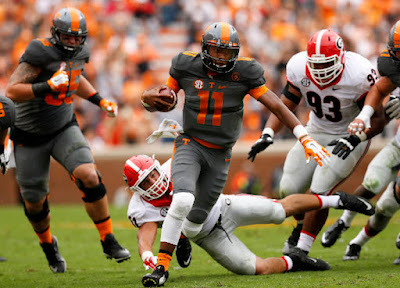 The Nike-designed Smokey Grey made their debut during the Vols' 38-31 overtime victory over Georgia last season. Don't expect the unis to show up in this upcoming season's showdown with the Dawgs, however. The game is being played at Stanford Stadium in Athens, Georgia on Oct. 1.